Looking to start a food truck business and wondering how much food trucks cost? In this article, we’ll explain your 3 choices when looking to buy a food truck and all the costs and risks associated with each. If you’re looking to start a food truck business, or just tossing around the idea, your first question is probably focused on price. It’s a question that we get every single day from the many entrepreneurs that want to make their culinary and business dreams a reality. $50,000 – $100,000 for a used food truck. The risk of hidden costs of repairs to the engine and kitchen will be high for lower quality trucks in the $50,000 range. 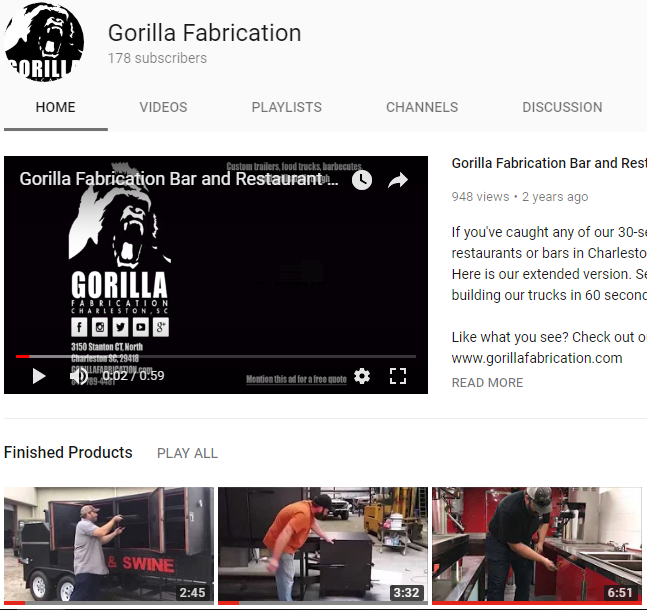 $75,000 – $100,000 for a new kitchen on a used truck chassis. Building a new kitchen can help you down the line, but a used truck may have mechanical problems that keep you off the road. $100,000 – $175,000 for a brand new truck with a new kitchen. When you buy a new kitchen on a new truck, you’ll have much fewer hidden costs down the line. Next we’ll cover what these prices actually mean in terms of the risk your taking on and some of the hidden costs you could face. The first choice you have is to buy a used, as-is food truck, which means that you get the truck and equipment in the condition that it’s in. It’s like buying a home that’s a fixer-upper. The price for an older truck can be around $50,000, and at times you may find one on the Roaming Hunger Marketplace for as low as $35,000. A newer custom built used truck can go for as much as $100,000 or more, depending on the specs. The thing to remember when getting a used food truck is to be very careful about the condition of the truck because there’s no refunds. What you see, and sometimes what you don’t see, is what you get. The cost of a used food truck is appealing. The sticker price on a used, as-is food truck is significantly less than a new food truck. If you’re financing a truck yourself and don’t want to take out a loan, the cost will play a major factor. If the food truck was on the road recently, it may already be permitted to work in the area. That’s a time-saver. For more permit tips, check out our Tips And Tricks To Make It In The Industry article. If there were warranties in place for the vehicle or the kitchen equipment they will likely be expired. That means you’re on your own when something breaks. When you buy a used truck and equipment, you aren’t 100% sure what works and what doesn’t. If an owner is ready to sell, the overall condition of the truck and kitchen may be hard to assess. The owner may have delayed maintenance to save money, which means you inherit more problems. The risk is you could get hit with some big repairs. For instance, a water heater failure costs up to $3,000, a deep fryer failure costs up to $5,000, a refrigeration and freezer unit failure costs up to $6,000, and engine, transmission, and drivetrain failure can rack up expenses to the tune of $12,000. It’s almost impossible to get financing for a used, as-is food truck. Since the condition of the truck and equipment is questionable, it’s too risky for banks and financing brokers to provide a loan. If you’re an entrepreneur with no existing small business to take out a loan against, you’ll have to pay out of pocket for the entire used truck. When you buy used, you get stuck with the kitchen layout and equipment that it comes with, which may or may not work for your food concept (you can’t make pizza on a burger truck). Making changes is tough since plumbing, electrical, and gas lines are all installed. If you do make major changes, you’ll likely need to re-submit new drawings for permit approval and then go through re-inspection by your local government agency before you can get on the road. 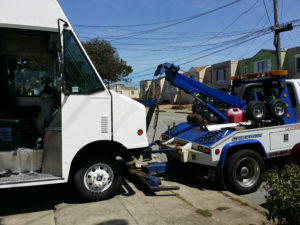 Just because the food truck was once on the road doesn’t mean it’s ready to go. Your food truck has to pass inspection, and be permitted before you start serving customers from it. Even if everything is totally functional and passes inspection, a used food truck might look a little rough. It might need significant cleaning or cosmetic repairs inside and out. At the minimum, plan to put in some serious elbow grease to make your kitchen chef-worthy. Or, expect to spend up to $500 for a deep clean plus $800 for a mandatory hood cleaning, if you hire a professional. You can decide to buy a new kitchen and have it installed on a previously owned truck. Think of this like adding an addition onto an older home. Your new kitchen will be built from scratch and customized to fit your preferences and food concept. 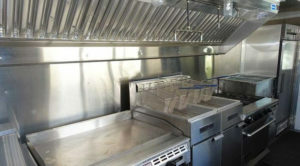 Food truck kitchens are small spaces and you want every inch to be as functional as possible. A new kitchen creates an opportunity for every appliance and work surface to support your food concept and maximize sales. Plan your kitchen very carefully, it could be the difference between a successful business and one destined to fail. A recent survey of Roaming Hunger’s food truck building consultants shows 18’ kitchens built on 22’ truck chassis are by far the most requested size. Take a look at our article on food truck commissaries for more kitchen layout tips. You’ll have more financing options available when you buy a new kitchen on a used truck. That’s because both you and the bank understand the value of the two parts that make up the whole. When you provide the bank with receipts from the builder, they will show the total cost and value of the kitchen. These receipts coupled with the fact that used commercial trucks are bought, sold, and financed every day means that banks are comfortable with this situation. For more financing options, check out Kiva, a company that offers loans to food truck entrepreneurs. A new kitchen means new appliances, which usually come with a one year manufacturer warrantee. New appliances are less likely to need repair compared to used equipment and won’t require as much maintenance. These lower long-term maintenance costs should factor into your decision to buy a used or new kitchen. You might be able to get used trucks at an auction or for sale locally. Of course, this can be a riskier investment since maintenance records or mechanical inspections often aren’t provided. To make sure you’re reducing the risk of anything going wrong, you may want to completely over-haul the engine. With a used truck, it might not be as reliable as you’d like it to be. Fleet vehicles from big transportation companies like UPS or FedEx are one of the major sources of used truck chassis for the food truck building industry. These companies typically drive them as part of their fleet for about seven years before reselling them, so it’s rare to find a newer truck chassis with less than 100,000 miles. While they are typically well maintained, their peak performance is likely behind them so reliability should be considered. If your truck won’t start or has maintenance problems, you might miss a catering job or the chance to sell to the lunch crowd downtown. The repairs might not be a quick fix either. If your food truck is in the shop for a week or unexpectedly quits, you’re losing money and customers every day. Currently, popular vehicle models for food trucks include Ford F-59 step vans, Chevy P-30 step vans, and Freightliner MT55s. While they are solid trucks, regulations and permitting requirements are constantly changing, which means entrepreneurs should buy a truck that meets the strictest of standards to avoid costs down the road. In the food truck mecca of Los Angeles, for example, a regulation now requires 2009 or older diesel trucks with a gross vehicle weight rating (GVWR) greater than 14,000 pounds (most weigh anywhere from 12,000 pounds to 16,000 pounds) to either install a $10,000+ converter kit or replace their existing engine to comply with reduced emissions standards. This law will be phased in over the next six years, with the final phase ending in 2023. Buying a truck that’s not up to the strictest standards could cost you a chunk of change as regulations evolve in years to come. To plan ahead, consider staying away from diesel-fuel models and look to build your kitchen on a fuel saving, low emission hybrid truck chassis like the Toyota Hino. Putting a new kitchen on a used truck can save you money upfront, but you’ll still have to put money into the truck to keep it running. Expect to deal with some big-ticket problems on a used truck within the first three to five years. These costs should weigh into your decision to buy a used or a new truck. If you don’t have the cash in hand to pay for a food truck and need financing, then building a food truck is the best way to make your dream come true. Even if you have the choice, there are many reasons why building a truck makes more sense than buying used. The price of a brand new food truck will be between $100,000 and $175,000, depending on your concept, the size of the kitchen, and the builder you’re working with. Buying a new truck comes with warranties, usually a 5-year/100,000-250,000 mile warrantee depending on the truck model. This warranty can save you thousands compared to the repairs you face with even a well-maintained used truck. The warranty on a new chassis can easily make up for the cost difference between a used truck and a new truck. You can save money on the interest rate when you finance a new kitchen and truck. Did you know that you can get separate loans for the new vehicle and kitchen? According to some food truck-friendly banks, you can finance new kitchen builds for as low as 4.5% and a new truck for as low as 3%. The 1.5% difference in interest can add up to big savings on your monthly payments. A new truck offers you the reliability you need to build a loyal customer base and solid reputation, which are two vital keys to success in the food truck world. Building your kitchen on a new truck means you’re less likely to break down, less likely to cancel appointments and less likely to disappoint customers. Reliability is crucial to your success and shouldn’t be overlooked when you’re making a decision to buy a food truck. You’ll have the opportunity to build a truck that meets the strictest current and future regulations, not just for your local town, but for anywhere in the U.S. This kind of foresight means that you’ll have the freedom to operate your business practically anywhere in the country for years to come. If you do choose to sell your food truck, your investment is going to get a higher return than an older truck. Used, as-is trucks that were originally built as a new kitchen on a new chassis are highly sought after, retaining almost original MSRP at $99,000 – $110,000. 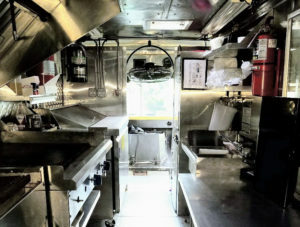 Compare this to used food trucks that were built as new kitchens atop an old truck chassis, which might sell for $50,000-$85,000 depending on equipment and condition. You can also expect to have a wider buyer pool when you resell thanks to the foresight of building your truck to stricter regulations that allow the truck to operate anywhere. The upfront costs of building a new kitchen on a new truck are higher than the other options listed, which may seem prohibitive for those looking to spend less initially. The reason for these higher costs upfront is because you’re paying for an entirely new kitchen build out, custom made to fit your needs. In conclusion, it is clear that the type of truck and kitchen you buy is an important decision. Each option comes with certain costs, some upfront and others hidden, and with certain risks. If you’re not sure what is right for you, continue to do research and work on your business plan. But also trust your instincts. If you are looking at a truck and something doesn’t seem quite right, hold off on making a decision until you can do more research. Also, don’t forget that we are available to talk to you at any time. The Roaming Hunger Marketplace is a valuable and free resource to food entrepreneurs that want to get into the food truck industry. Not only will we give you honest advice and tell you what we’ve learned over the years, but we’ll help you connect with reliable food truck builders and plug you into our Roaming Hunger vendor network once your business is off the ground.